This is the fourth part of our series on Lean Project Management. In this post we begin our review of Lean principles starting with visibility and manageability of resource queues. What is a queue in Lean project management? A queue is the duration of time when something is ready to be worked on, but is waiting for someone to work on it, is called wait time or queue time. The duration between starting a task and completing a task is called execute time. In traditional product development, wait time is typically much greater than execute time. An engineering change order waiting to be reviewed and approved. Parts waiting to be inspected. Information waiting in someone’s head to be shared with someone that needs it – e.g., What are the test results? For the sake of this and future discussions, I’ll present a simplified view of a resource in a typical hardware team, where there is a mix of projects currently being executed. The diagram above focuses on a single component of our system – a single resource. 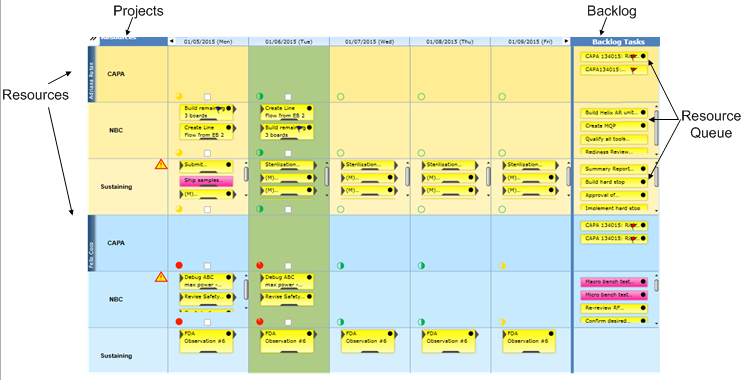 The work is represented as discrete critical and non-critical tasks in the form of stickies (the yellow and pink boxes). Tasks sit in the resources queue until the resource starts to work on them. They are then placed in the “Resource” pipeline of active work. In later posts we will enhance this diagram and look into the pipeline, as well as represent more real life conditions, but we have started the discussion with this simplified view to make one very important point: the real priority of each task varies. We will discuss priorities more in a later post. For now, we’ll keep it simple and note that some tasks are ‘critical’ and some are not. ‘Critical’ means that a delay of the task will probably cause a delay in the project. Again – this statement assumes that the resource doesn’t start working on the tasks as soon as they arrive and multitask just to get them out of the queue. Multitasking causes the durations of all tasks to get much longer while they are in the resource pipeline as we will see in later posts. Note – that ‘just work faster’ and ‘apply more pressure’ are not listed as options for increasing the departure rate. We cannot clear a queue by increasing the pressure to force the work through the pipes. This directive often backfires by encouraging people to multitask and take too many risks or make more errors. We will discuss this more in a follow-up post on push and pull. Besides the clearing strategies above, the other tactics to minimize queue time prevent the queues from getting long in the first place. I will summarize these methods here, as we will be diving into these in later posts. Most forms of visual work management help make queues at least a little more visible, and some do a better job than others. Almost all of them obscure the real queue with tasks that aren’t really there yet. This is an important but subtle part of the definition of a ‘queued’ task. A task is only in the queue when it is ready to be worked on. This only becomes the case, generally speaking, when all of the tasks that must precede it are complete. For example, a shopper walking around the grocery store still picking out their groceries is not yet in the checkout line queue. A test that can’t be run because the test units aren’t built yet isn’t really in the tester’s queue either. A task that can’t be started yet isn’t technically in the queue. Most forms of VWM miss this important point entirely. Wall Gantts are not very effective at making queues visible. Many of the stickies (tasks) on the resource’s row have incomplete predecessors, which makes the actual queue size difficult to identify. There are work-arounds, such as adding a queue dot to the sticky, but these techniques are difficult to sustain. 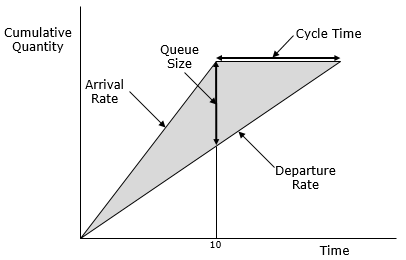 If set up properly, a process-specific Kanban, can be a little better at showing queues, but not necessarily the ‘resource queues’. Instead, these show what I call ‘lifecycle queues’. For example, there can be a few stickies waiting in the ‘ready for system test’ column which lies just before the ‘in system test’ column. The problem is that very often a resource will have tasks spread across many different lifecycles on many different project boards, as we discussed in the previous post. With this approach, we still lack clear visibility to the work that each resource has on their plate across all projects. In most hardware development teams, because the resources are so specialized and there is a high mix of different types of projects and sub-processes, good visibility to each resource queue is essential. Without this visibility, each resource’s priorities are less clear and it is more difficult to determine when each task will be completed and when queue clearing measures are necessary. 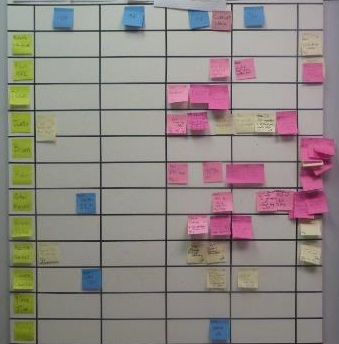 The ‘To-Do’ or ‘Backlog’ column in a generic Kanban approach is usually a little better view of the resource queues. However, the same issue usually exists -- some tasks in the To-Do column are not ready for execution because of incomplete predecessors. This again obscures the real queue. Also, the resource queue is difficult to see across projects if those projects are spread across multiple boards, which is most often the case. This is yet another example of how the tools that evolved in software development miss the mark for hardware teams. In software development, dependencies between tasks are far fewer and less complex than in hardware projects. Generally, most software tasks are already in the queue by the time they are added to the project boards. The few dependencies that exist are easy enough to manage ad-hoc. Finally, queue visibility is enhanced by granulizing the work well. Rather than one big, multi-week task with a lot of hidden subtasks, we benefit by granulizing and showing the subtasks when we can. There are many good reasons for task granularity, and making the resource queues more visible and manageable are only a couple. Queue visibility is a key differentiator of Playbook. The resource queues in Playbook are highly visible – across all resources and activities, as well as across projects. If the predecessor is complete, then everything required to start the task is complete and the task is ‘queued’ as indicated by the black queue dot. In views for the standup meeting, and in the view which spans all projects and activities, anyone can see the current queue for any resource(s) they select. Work is visible on the tasks when desired, and the tasks have good granularity because the whole team can easily use the tool. I could go on, but this series is about the underlying principles and conditions of hardware development, so let’s get back to talking about the system we are trying to improve. If you would like to know more about Playbook and queue management, please do not hesitate to contact us. In the next post, Part 5 we looked at the enormous impact of resource overload and variability on product development systems. Thank You and credit to Don Reinertsen who introduced us to the power of watching and managing the queues, and a great many of the points I will be making in this series. What is the number one cause of project delays? It's not what you think. Watch this 9-minute video to find out what is.